Hello, everyone! I'm back from my family annual camping trip. There were 24 of us camping together. We rented 4 sites and probably the noisiest bunch. lol We went to Shuswap lake up north/east about 5 hours drive from Vancouver. It was a very nice campsite. 2 days before we left for our camping trip my oldest daughter asked me to make a camping book for her to write about her trip. Of course I can't just make 1 so I made 7 of these. I only made for the little ones this time since it was so last minute. Very simple book for her to track down what she did during camping. This was the section of the lake for dogs. You can let your dogs swim here. Picture of islands across the lake. Here a picture me sitting on a bench by the beach. Did you notice the level of water under me? 2 weeks before we were here it rained so much it flooded the lake and the inland. Lots of pools of still water on the inland so there were lots and lots of mosquito. I got about 60 mosquito bites. I'm itchy all over. Hope you enjoy looking at the pictures of my camping trip. Thank you for stopping by! I'll be away for a family camping and will be back July 16. If you have questions I'll answer them when I get back. Hi, stampers! I finally got a chance to play in the Mojo Monday sketches. I love it that I don't have to think up a layout. I decided to make Christmas cards in July. I made two cards with the same sketch. Here is the link to Mojo Monday 248 if you are interest in playing along too. Hello, everyone! I made an easel card using the new Reason to Smile stamp set. I think the stamp set name is very fitting. 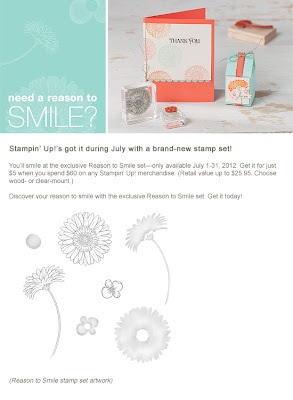 For the month of July with a $60 purchase you can get the Reason to Smile stamp set for just $5. Isn't that a reason to smile? You can't get a better deal than that. For $5 you get 7 stamps in this set. Normally one stamp can cost you from $5-$10 depends on the stamp size. Well, I'm off to make some more cards with this stamp set. Thank you for stopping by!